This is intended as an immersive participatory audio environment. 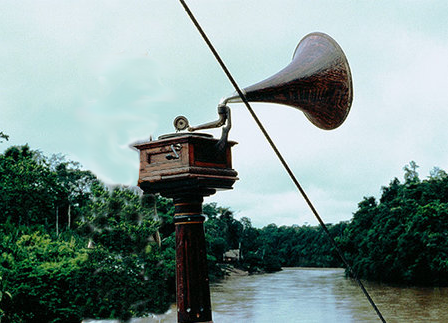 Engaging in broadcast transmission means that each listener has their own unique auditory experience as a result of the sum of the environmental parts. For example, the sound reproduction technology (radio), the acoustic of the room it is situated within, the sounding activity and location of the “listener” as they interact with their physical space, the drifting in and out of focus as attention shifts from the listeners presence in the physical and the information from the transmission sounding device that aurally “colonizes” the physical space with its content. Bearing this in mind it is recommended that this piece be diffused at a reduced amplitude (low volume) so that divisions between the three environmental inputs: transmission media, ambient environment and participants sounding actions become blurred and result in a participatory immersive auditory event. This implies that the hermetically complete “work” no longer exists: The environment and the work can’t be distinguished. This entry was posted in #34 and tagged Eastside FM. Bookmark the permalink.